Just this morning, I placed an order for a very special life vest. One of the other moms in our support group recommended this life vest for INAD kids. Her son is six, and still uses his almost every day. I was so excited when she posted it because Grace has really enjoyed swimming this summer. And she definitely likes being independent, which is tough. We have had some success with a raft, but I like the idea of her being able to be upright in the pool as well. Princess Grace getting ready for her pool party. When we first looked into the life vests, they were kind of pricey, but we knew we wanted to have one for Grace. And we also knew it would last a long time. The other family has been using theirs for three years. But thanks to the generosity of some local swimmers, we got it covered. 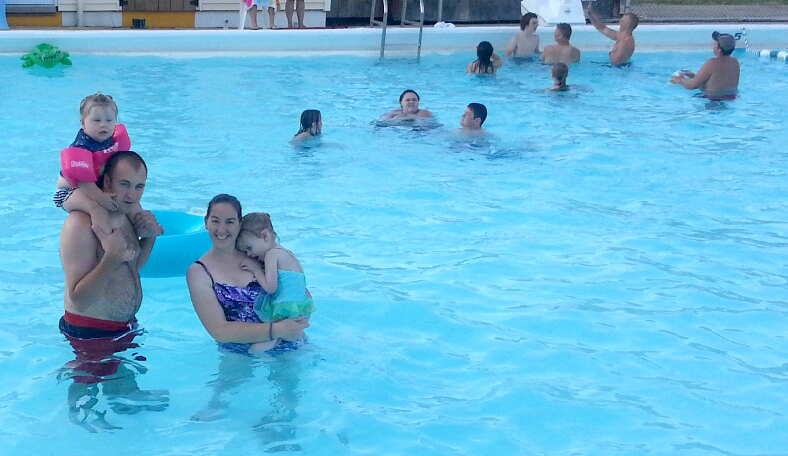 Grace and I had so much fun splashing in the Kiddie Pool. One hot afternoon this summer after speech therapy, Grace and I ventured down to Central Park Pool. I admit, I probably haven't been there since I was a swimmer in my youth, but it was fun to see how well they have kept it up. We swam in the water, and played on a raft, before hopping out to enjoy an Arctic Rush slushy. Pool manager Amy Hacke came over to talk to me several times, and said Grace and I were welcome to come by anytime. Hanging out with Skylar in the Kiddie Pool. Shortly thereafter, she sent me a message asking if they could host a pool party in Grace's honor to help buy her new life vest. They know Grace likes to swim, and thought it would be a fun way to get the community involved. So, we picked a Thursday night in July, and got the perfect night for a pool party. Connor loved playing with Grace in the water. Grace and I arrived with mom and dad, and enjoyed some pulled pork, made by Amy's husband, Kyle, and had a chance to watch many come to swim. They had even reserved some chairs for us with a special Princess crown for Grace. She loved it. The Jenkins family came to hang out too! After dinner, Grace and I made our way to the Kiddie Pool to splash in the water. Several of her friends from preschool came to swim, and they loved playing with her. They would bring diving toys to her, and Grace and I would throw them into the water for her friends to find. Grace just giggled and giggled every single time. Pool Manager Amy Hacke talking to Grace. Then we tried out her raft, and another preschool friend, very carefully pulled her around the Kiddie Pool, much to Grace's delight. And I was delighted to watch her friends playing with her. Lifeguard Ryan Robinson and Grace's friend Skylar play with her on her raft. We went over to try the big pool, but Grace was getting pretty tired. So, she and I snuggled some in the water, until it was too cold to keep going. We dried off and shared an Arctic Rush "minion" slushy and some M&Ms candy. Although we didn't make it until the end of the party, we enjoyed watching the kids swim and checking out the awesome silent auction items. More than 100 people came to swim that night for Grace, and Amy brought me a check for $825 this week, which was more than enough to cover the life vest. Hopefully, it will be in within a couple of week, and I can't wait to take Grace back down to the pool to show it off. Hanging out with cousin Izzy and her dad, Phil at the party. Thanks to everyone who came that night, and continues to join us on our Grace-filled journey. What a lovely gesture! It sounds like you and Grace have a wonderfully supportive community who are great fun to be around too. The party must have been very enjoyable; thank you for sharing the photos. I had no idea that the vest would be so expensive, but it looks like it'll bring priceless fun for several years to come.